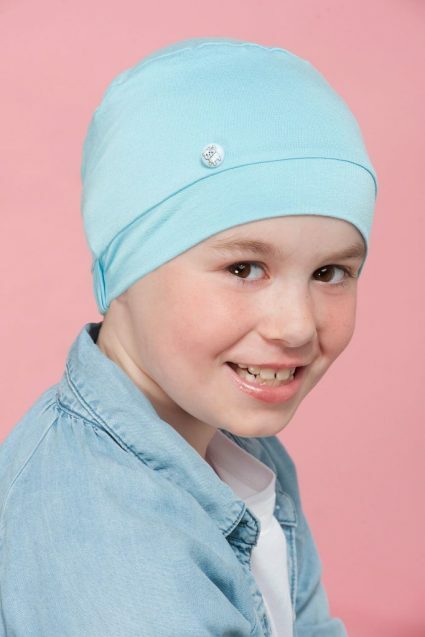 Cancer hats for kids – Millo Blue Kitten is part of our selection of Milo hats is an exciting addition to our range of our Masumi Kids Champions headwear that has been specially designed for children. Milo hats are designed and in the UK from softest cotton material and with no inner stitching used to avoid chafing or irritation of the skin. The hats are available in many fun styles and colours. Milo Blue Kitten, shown on this picture is a combination of blue hat finished with a fun cute little kitten. The snug fit means they are comfortable to wear all day long. Don’t forget also to check out our other designs such as our cute Brown Bear for boys and also our cute White Kitten.